I haven’t started this year off on the right food, from a health nor a cooking perspective. I pushed into 2018 with a cold. That horrible, no good, terrible flu that’s making the rounds. I was down for the count for days and have been “in recovery” for two weeks. I feel better – I’m not downing a pack of Dayquil every few days anymore – but I certainly don’t feel great. I haven’t been hungry. I haven’t been cooking anything beyond buttered noodles and frozen pot pies. My kitchen mojo is running on empty. But I tried. Lord knows, I tried. Staring at a bowl of citrus I brought back from Arizona, I had a brief glimmer of interest in making a cake. I creamed and I scraped and I zested. It was terrible – dry, pasty, a complete bust. I had baked the cake equivalent of how I felt. I was pissed I used the last two Meyer lemons from my sisters tree. I was pissed I wasted time, ingredients and what little energy I had making a crappy cake. But most of all, I was pissed I didn’t have any cake. The injustice of it all. So I retreated to the couch to regroup, comforting myself with grilled cheese sandwiches and Netflix binging. My food fixes came from a safe distance, from the continuous scroll of beautiful, delicious photography in my social media feed. I noticed a pattern. Sheet pan dinners appear to be very big the first few weeks of this year. Old favorites made reappearances. That gorgeous chicken with the vibrant emerald green sauce from the New York Times popped up yet again. This recipe stalks me, I’m sure of it. The powers of the internet are pleading with me to make this chicken. Maybe next month. I also saw an abundance of chocolate cakes. So much for resolutions. I think 2018 is the year of the chocolate cake. 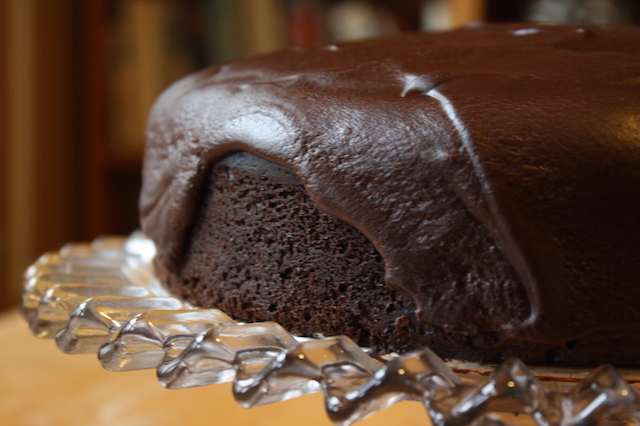 One in particular caught my eye, again from the NYT … World’s Best Chocolate Cake. Oh, really? A recipe from the prolific and justly popular Yotom Ottolenghi from his recent baking book, it was a bold proclamation. World’s Best? You throw something like that out there it had better deliver. I had a big bar of 72% dark chocolate leftover from holiday baking and nothing but time on my hands, if a low surplus of energy. Chocolate cake is sick food right? I had to know. It came together easily, made in one bowl with a whisk. I liked that. My foggy brain wasn’t up to navigating electrical equipment. A lot of chocolate melted with a lot of butter was a great start. The recipe called for self-rising flour but I didn’t have that on hand, nor do I suspect do most of you, so I went with the flour/baking powder option noted. Eggs, sugar, vanilla, cocoa and a smidge of hot coffee. Sounded promising and not that all different from my standard recipe. Into a buttered pan for a long, slow bake. The house filled with an intoxicating chocolate smell, which delighted me because I realized I could finally smell again. Small victories! This is a simple, one layer affair though you could certainly complicate matters by slicing it into layers it if you like. I made the ganache as directed, in a food processor, something I’ve never done before. Easy enough though I’m not a fan of washing dirty food processors so I’ll probably stick my preferred immersion blender method in the future. Same diff. The ganache was smooth, glossy and rather gorgeous when freshly made but later separated, which annoyed me. I’ve been having this separation problem a lot lately. Fat content, agitation, liquid content. It’s all a potential issue, just not one I felt like solving at the moment. So I poured it on top of the cake anyway, with little ceremony, and smoothed into place before it was properly set and a touch too soft. So it’s not completely smooth and glossy and the photographs highlight the graininess. Whatever. I just wanted cake, ascetics be damned. So, the big question. Is it the World’s Best? Hmmm. It is a good chocolate cake. On a grey, miserable drizzly day, it was a bright spot of happiness. It’s a simple recipe that comes together easily, without a lot of special equipment. And it’s good. Very good. But World’s Best? It pains me to say this, but in my opinion, no, it is not the World’s Best. I’m not sure any cake could live up to that proclamation but this one is very dark, very rich and very fudgy. 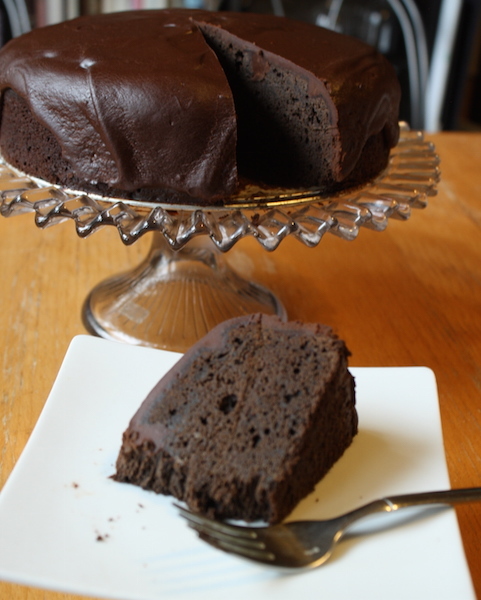 It’s just that my idea of a perfect chocolate cake is different – moist, with a soft crumb and I prefer layers, all the better to hold more icing. And much to my chagrin, this cake is better at room temperature too. Dammit. All things considered, I’d say it’s a Pretty Good Chocolate Cake if pressed with bonus points awarded for how easily it comes together. Things can only get better from here. STRESS THERAPY BAKING FACTOR: PRETTY GOOD. Chocolate cake solves a lot of ills. I know this first hand. This is the kind of recipe that you can put together when you’re not at the top of your game or knocked a little off kilter by a double dose of cold medicine or short on time and/or enthusiasm. It’s not overly complicated or fussy and it is pretty delicious. Anyone would be happy to receive a slice. And if it doesn’t turn out perfectly (ahem … see my photos), that’s ok. I posted this to show that sometimes, even we supposed professionals, miss the mark. But it’s still good. Its chocolate cake for crying out loud. All is good. Heat oven to 350°F. Grease a 9” round springform pan with butter and line the bottom with a round of parchment paper. Set aside. 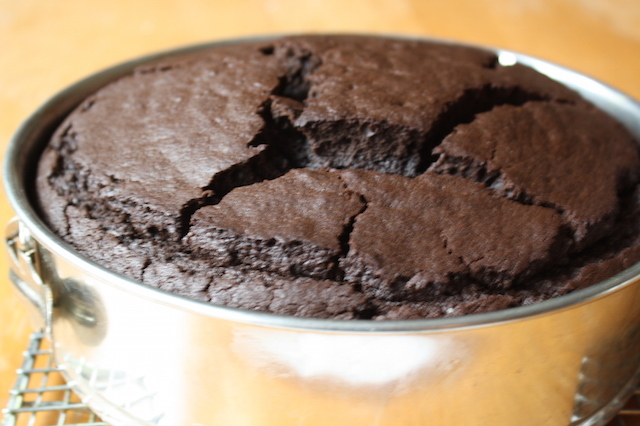 for the cake: Sift the flour, baking powder, cocoa powder and salt together into a bowl; set aside. Dissolve the instant coffee in the boiling water. Set aside. Whisk the hot coffee into the chocolate/butter mixture until smooth and well combined. Slowly whisk in the eggs and vanilla extract until thoroughly combined and smooth. Whisk in the flour/cocoa mixture until well combined. The batter should be fairly loose. Bake for 50-60 minutes, or until a skewer inserted just off center comes out clean or with just a few dry crumbs attached. The top will form a crust and crack a little, this is ok.
Leave the cake to cool for 20 minutes before removing from the pan, then set aside until cool completely. for the ganache: Place chopped chocolate in a food processor, pulse until fine and set aside. In a small saucepan over medium-high, bring the cream and corn syrup to the point just before a boil, where bubbles just begin to appear around the edges. Remove from the heat. With the food processor running, pour in the hot cream in a steady stream through the feed tube over the chocolate. Process for 10 seconds, then add the butter. Use a rubber spatula to scrape the ganache into a bowl and cover with plastic wrap, with the plastic touching the top of the ganache to prevent a skin from forming. To assemble: Peel the parchment from the cake and discard. Transfer cake to a serving platter and spread the ganache on top of the cake. The cake will keep well for 4-5 days in an airtight container.